You could be forgiven for thinking that Hirai Ken had mixed blood. Tall, handsome, with a decidedly Caucasian profile and curly hair (think skinny Lenny Kravitz without the tatoos), he didn't look anything like the typical Japanese pop singer when he made his debut back in 1993. But as J-Pop started featuring more artists with a distinct R&B flavor in the late 90s, it was Hirai's sultry, exotic appearance as much as his soulful style and piercing falsetto voice that helped propel him to the top. While still a student in 1992, Hirai took part with 7,500 other hopefuls in an audition with Sony Music in Yokohama. He signed with the label the next year and in 1995 he released his debut single Precious Junk from the album un-balanced. This and his second single, Video Jam, were both used as theme songs for TV dramas, a sure-fire way to boost sales. His first national tour followed at the end of the year. 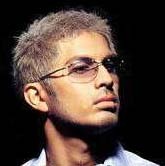 He recorded his second album, Stare At, in 1996 to considerable acclaim but that was when Hirai dropped below the radar. The next three years saw just three singles as Hirai worked on developing his style and image. He hit the big time in 2000 with his third album The Changing Same and the hit single Rakuen (Paradise). The single got considerable FM airplay and firmly established his reputation at home and abroad. He was the first Japanese artist to take the classic test of a true R&B performer - playing at the Apollo Theater in New York, where he got a warm reception. Building on his popularity in Asia, he appeared at the MTV Music Summit in Taiwan later in the summer and went to Hong Kong to receive the Best New Japanese Act award from RTHK radio. 2001 saw his single Kiss of Life used as the theme for the popular Love Revolution TV drama series. His fourth album Gaining Through Losing and a national tour of the same name built on his solid reputation. He had already shown that he had the urge to perform abroad, so his live appearance on the Music Fair show in March 2002 with producer/singer Babyface from an LA studio was very much part of the plan. In the summer, things like winning the Best Male Artist at the inaugral MTV Music Video Awards Japan and appearing in the official FIFA World Cup concert with Chemistry and Lauryn Hill seemed like they were just par for the course. Already an established star, Hirai went one step further when he released a cover of Okina Furudokei (My Grandfather's Clock) in 2002. A popular nursery rhyme, it was expected to be a minor success, but it went on to become one of the biggest hits of the year. Hirai Ken is with Sony Music (Japanese).